This roaster is oven-ready and equally suited to family suppers or festive parties. If you’d like, substitute other root vegetables, such as fennel, turnips, beets, or sweet potatoes. Position oven rack so top of chicken is just above middle of oven. Preheat oven to 425°F. Lightly coat large roasting pan (about 16”x12”x3”) with cooking spray. Make certain pan is large enough to provide space around chicken for vegetables. Rinse chicken well inside and out; pat dry. Place roasting chicken breast side up, on rack in the pan. Toss together orange, garlic, and fennel seed in small bowl. Using your fingers, loosen skin of the chicken breast. Carefully insert orange mixture. Rub skin with olive oil and sprinkle with salt and pepper. Tuck wings. Pour water into bottom of roasting pan. Roast chicken for 30 minutes. Reduce oven temperature to 375°F. Place potatoes, parsnips, and onions around chicken. Do not overcrowd pan when adding in potatoes, parsnips, and onions. If your roaster is not large enough, put extra vegetables in a separate ovenproof pan lightly coated with cooking spray. Baste vegetables occasionally with chicken pan juices. Continue to roast, basting occasionally and adding water as needed, for 1 1/2 to 2 1/2 hours or until pop-up timer pops up and thermometer registers 180°F. The juices should run clear with no hint of pink in the meat. Remove chicken from oven and let stand for about 10 minutes. Remove pop-up timer prior to carving and serving. 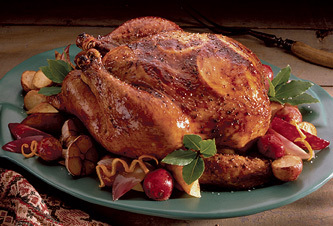 Roasting guideline for chicken is approximately 21 to 24 minutes per pound.